We are excited to share some great news with you. San Diego earned the No. 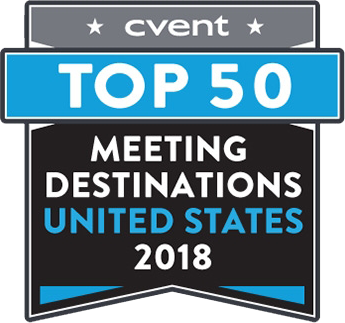 4 spot on the Cvent 2018 Top 50 Meeting Destinations list! As a destination, we’ve moved up one spot from last year, so let’s keep the momentum going. This industry-specific ranking is based on many factors including meeting and event booking activity as well as the number of unique venues in the destination. San Diego improved its place in the Top 5 with new inventory coming online in the coming months. Considering San Diego has significantly less meeting space at its primary convention center compared to other top destinations, it’s rewarding to see San Diego rank so highly. This is due in part to its diverse offerings of meeting and conference hotels, award-winning convention center, unique regions, and exceptional attractions and third-party venues. For a list of upcoming projects, download our Development Report here. View the Cvent Top 50 Meeting Destinations list here. Check out unique meeting and event spaces in San Diego on the official Meeting Lists at SanDiego.org.